Not everyone wants to make a big and bold statement at their wedding, which is why a pastel colour theme may be ideal for some couples. Pastels cover a wide range of shades and hues and can complement a wide variety of other themes and styles. Their versatility and subtlety means they can be easily combined to create unique wedding ideas without giving the appearance of being overly fussy or ornate. As pastel colours tend to evoke light and delicacy they are best suited to spring and summer weddings where autumn and winter tend to use bolder signature colours, but pastels are also so adaptable that you can even combine them with bolder colours as complementary tones, and they also work very well with a gold or silver wedding theme. The trick with using pastels well in your wedding theme is to use them to complement the theme rather than dominate it. If you want a classic or traditionally elegant feel then dusky pink or lilac looks classy when combined with ivory and lace, while baby pinks and baby blues work better for a more youthful and up-to-date look. 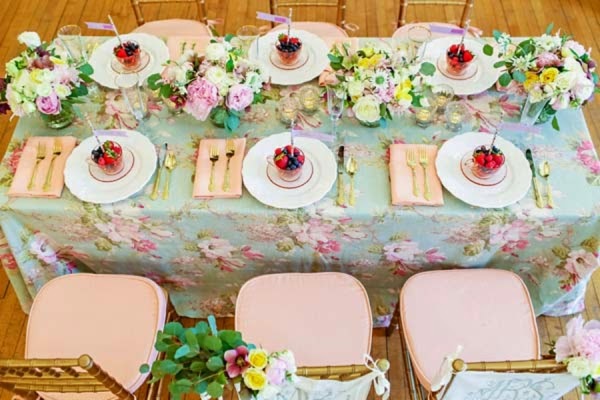 You can even have a tea-party wedding which works brilliantly with pastels if you team up the colours on crockery and iced buns and cupcakes. For a very fresh and modern feel go for yellow and green, and you can match those colours up with the food you serve for a lovely citrus wedding theme. For an autumnal wedding pick shades of peach and orange which work well with brown, red and gold wedding themes.. Your wedding flowers are one of the best ways to show off your colour scheme, and pastels are very common in the natural world so you shouldn't have a problem putting your pastel scheme into practice with your bridal bouquet and other flowers. One very effective technique is to add a little bit of colour to white arrangements by adding a scatter of subtle pastels which gives real depth to the visual presentation of your flowers. Don't forget to keep the colour scheme consistent across your bridesmaids' flowers, in the button holes and corsages for the rest of the wedding party, in the decorations for the ceremony and reception and in the wedding favours for your guests to take home with them. Extend the theme into your bridesmaid dresses as well as your groomsmen and other attendants' outfits. As dark colours are traditional for grooms you can add pastel accents with neckties or flowers on pockets, or you could ignore tradition and send out heavily themed invitations asking guests to dress to match your theme. 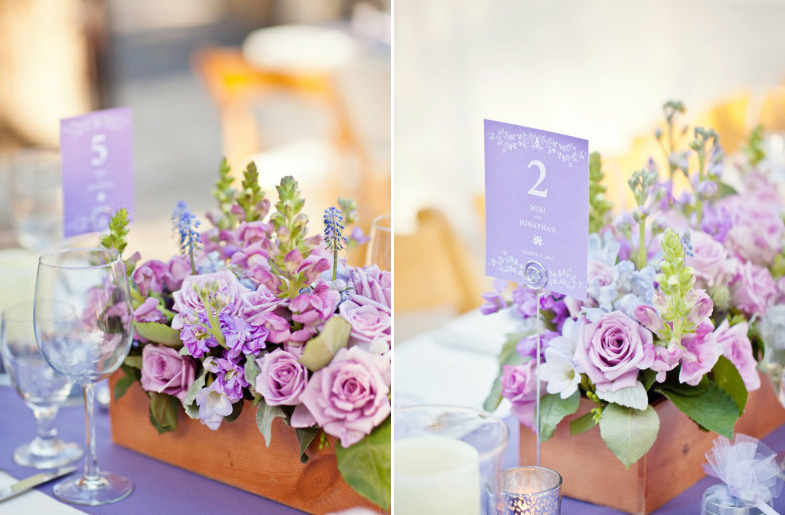 You can also incorporate pastels into your reception table centrepieces and wedding cake decorations. Keep an eye out for colour candles and vases for tables. You can use cake stands as centrepieces which work well when decorated with silk flowers, beads, pastel sweets or wrapped chocolates and other party favours for your guests to take home with them. For a healthier option that matches the colour scheme you can use fruit as an edible decoration too! Keep the linen in line as well with pastel table runners, tea lights, napkins, placeholders and wedding balloons. Have your wedding cake decorations follow the colour scheme too - you can always have coloured icing or flowers and ribbons to match as well. For a nice treat for younger guests (or just the young at heart) you can serve cupcakes or sticky buns with pastel icing instead of (or along with!) your more traditional tiered wedding cake. 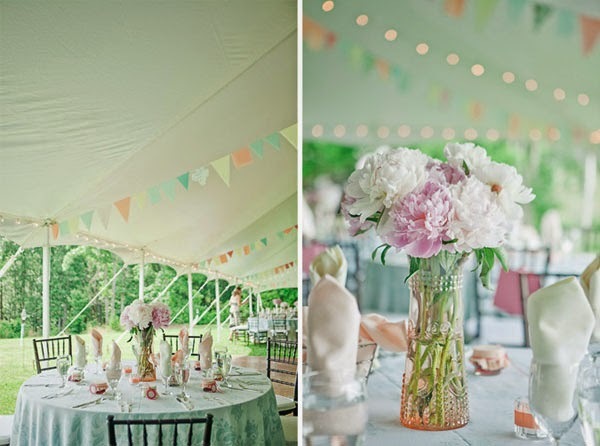 Remember pastels can be adapted to match up with more or less any wedding theme as well as forming the basis for one if you are looking for ideas. Have a browse around online and look at some pictures to inspire you, and then get creative with your beautiful pastel wedding!